Does Science Disprove God and the Bible? John Loftus is well known for his ‘conversion’ from Christianity to atheism. Is he right about God? Loftus claims that science is a better explanation of existing phenomena than the Bible. He also believes that Christians are ‘not’ scientifically literate and need to ‘become informed.’ Is he right about that? That’s one way to respond to atheists who make a statement about ‘science’ disproving God and the Bible. The intention in such a response is not to be disrespectful or push aside the argument. It is meant to lead to a robust conversation about the Bible and various sciences that are addressed in its pages. Rather than dodge the ‘science vs Bible’ debate, the purpose is to elevate it to a real discussion that’s based on evidence, reason and logic. One of my favorite attacks toward Christians on talk radio more than 45 years ago was about science disproving God and the Bible. Scores of Christians called my radio show every week to argue about it, but none of them could answer my questions about science and the Bible. It wasn’t that there were no answers, but the Christians who called didn’t know the answers or were not able to articulate what they knew. It wasn’t until I interviewed a Christian who was a professor of science that I began to see another side to the debate. Let’s begin by defining a primary term used in the argument. a subject that is formally studied in a college, university, etc. The ‘scientific method‘ is defined as “principles and procedures for the systematic pursuit of knowledge involving the recognition and formulation of a problem, the collection of data through observation and experiment, and the formulation and testing of hypotheses” (Merriam-Webster). Science is not knowledge or a system of knowledge about just ‘one thing,’ as in the atheist’s statement that “science disproves God and the Bible.” Science is a method of learning about ‘many things’ (e.g. scientific method). Let’s look in on the conversation between the atheist and Christian to see what comes next. Atheist: “What do you mean ‘which science’? Christian: “There are many scientific disciplines and sub-disciplines. Which one do you believe disproves God and the Bible? The claims I made as an atheist about science disproving God and the Bible were broad and sweeping. I had some specific things in mind when I said that to Christians, but expressed my thoughts in a general format by using the term ‘science’ to cover all of my arguments. It wasn’t until a Christian narrowed the terminology in our discussion that I began to think about God and the Bible in specific terms. Discussions Christians have with atheists should be narrow and specific so the Bible is viewed in its correct context to statements it makes that relate to various aspects of ‘knowledge’ (science). The Bible is not specifically a science ‘textbook,’ but many scientists have found the Bible to be scientifically accurate in statements recorded in its pages. That, I believe, should be the discussion Christians have with atheists. 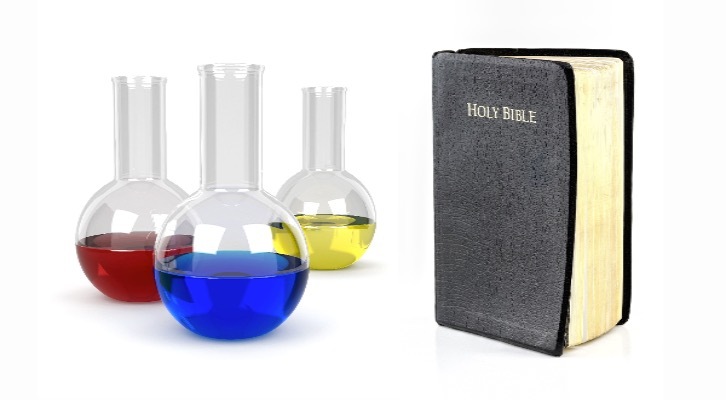 Let’s take the first verse in the Bible as an example of how science and the Bible work together. That is not an exhaustive list, but it’s a starting point for a discussion about science and the Bible. Imagine building a list of sciences that could be used in a discussion about every verse in the Bible. With more than 31,000 verses in the Bible and hundreds of scientific disciplines and sub-disciplines, theists and atheists have their work cut out for them to investigate science and the Bible thoroughly. Back to our example of the first verse in the Bible. The Bible claims there was a beginning – “In the beginning.” What say the sciences? Keep in mind that Moses wrote the words “In the beginning” during the 15th century BC. That was almost 3,500 years before modern science developed a theory of a ‘big bang’ beginning. The Bible claims that ‘God’ created the heavens and the earth ‘in the beginning.’ What say the sciences? I might add that ‘theology’ (study of God) is also one of the ‘sciences.’ In fact, theology was once known as “queen of the sciences” and was highly revered in universities around the world. The Bible was viewed as the ‘source’ of all truth and the foundation of an accurate worldview. Many of the great scientific discoveries of the natural world were made by scientists who believed in God, the Bible and the supernatural world. So, has ‘science’ disproven the first verse of the Bible? It has not. In fact, the scientific disciplines of astronomy and astrophysics agree with the Bible that the universe had a ‘beginning.’ That’s a good place to start the discussion about science and the Bible. The fact that Moses wrote, “In the beginning God created the heavens and the earth” (Gn 1:1), as this article points out, “almost 3,500 years before modern science developed a theory of a ‘big bang’ beginning” is classic example of the supra-reasonable aspect of biblical faith and the importance of trusting God and the word of God. A most exhaustive study of exactly how and why science and biblical faith are harmonized may be found in my recently published book, “Eternal Harmony, Volume 1: The Unity of Truth in God” (Rickards 2016), available at Amazon and other booksellers. For more information, visit http://EternalHarmonyMusic.com. God Bless. Hi, Kia. Our thread ran out of room, so I’ll pick it up here. Which branch or branches of science do you believe ‘actually and repeatedly’ contradict the Bible? That will be helpful as we move forward in our discussion. Thousands of verses in the Bible and hundreds of scientific disciplines. I can’t speak for others who believe the Bible to be God’s Word, but I am not proposing a theory ‘in order to fit’ what I want to believe and what the Bible ‘clearly says into a scientific sounding argument.’ I have been involved with journalism for 50 years, so the journalistic process is deeply ingrained into the way I approach life, information and truth. I’m not interested in theories to fit something I want to be. I’m interested in truth. If evolution is the truth, it will be clear on its own merits that it is true. It is not clear. Too many problems with the theory from geological, biological, astronomical, radiometric dating and human historical evidence. As for your statement that ‘we believe what we believe about God and the Bible by Faith alone’ … what is your definition of the word ‘faith’? The Greek word translated ‘faith’ in the New Testament is πίστις and comes from a root word which means ‘to persuade, be persuaded.’ The word πίστις was used for a position of trust based on persuasion that came with a guarantee or warranty. It was a ‘conviction’ of the truth based on presented evidence. Faith is the ‘substance of things hoped for, the evidence of things not seen.” (Hebrews 11:1) The word substance is ὑπόστασις and carries with it the idea of ‘confidence, assurance, reality, a guaranteeing.’ The word ‘evidence’ is ἔλεγχος and carries the idea of ‘a proof, persuasion, conviction.’ Greeks viewed it as ‘that by which a thing is proved or tested.’ If that is what you mean when you use the word faith, I am in agreement with you. My beliefs are based on evidence. I hold to what is evidentially true. The case for life on earth being thousands rather than millions or billions of years is a strong case. We will see how that case holds up in coming years of scientific investigation. As for me accusing ‘God of lying to us about the True age of the earth by making it only ‘appear’ to be older’ is not true. I would ‘accuse’ God of nothing, especially lying. The biblical account of creation in Genesis 1 and a closer look at human creation in Genesis 2 is worded in such a way as to present beings as fully formed at creation. You are my guest here. I am not offended with your directness and bluntness. We can be direct, blunt and civil at the same time. I appreciate your time in responding. Thanks! I’m reasonably sure that you have your burden of proof in the wrong place. most atheists do not say “There is no God” or that science disproves God (although science does repeatedly disprove the bible). atheists broadly dis-believe the evidence for God offered by theists of many stripes, not just Judeo-Christian believers. Hi, Kia. Don’t see a ‘straw man.’ Most atheists I’ve known during the last 50 years (including you) have said ‘there is no god’ and ‘science disproves God and the Bible.’ Atheist professor (UTC) and researcher Christopher Silver found 6 types of atheists in his 2013 research. Some ‘types’ of atheists wouldn’t word their arguments concerning science and the Bible in the same ways I’ve described, but most have to me. I agree that atheists ‘dis-believe the evidence for God offered by theists of many stripes, not just Judeo-Christian believers.’ I’m assuming you believe that is true, so you have made a ‘truth claim.’ Theists and atheists both make truth claims. We have some responsibility for defending our truth claims. You stated that “science does repeatedly disprove the bible.” That is a truth claim. I gave one example of how science and the Bible are in agreement with the first three words of the Bible. Do you disagree? If so, what scientific evidence do you propose? I look forward to discussing it with you. sorry to disagree and by the way… I’m sooo not an atheist. it’s nice to ask rather than assume. have a great day. You are correct. I made an assumption and apologize for that. Most of the people who contact me identify as atheists or agnostics. I am interested in why you believe ‘science does repeatedly disprove the bible’ and specifically which branches of science and which parts of the Bible. Thanks! apology accepted. for starters, are you a believer in the YEC 6days/6000yrs model of the genesis account? Hi, Kia. I believe that what the Bible appears to present is a 6-day creation event. The length of time since that event is not recorded directly in the Bible, though adding the ages of people and generations in the biblical record would appear to be in the thousands of years rather than millions of years. I follow the evidence from a variety of scientific researchers to see what studies of the heavens and earth show us. So, to be clear, you yourself believe that the earth is thousands of years old rather than millions or for that matter 4 billion years old? Hi, Kia. The actual ‘age’ of the earth is still being investigated in the science community. God could have created the earth long ago and created life on it more recently. God could have created the earth more recently with the appearance of great age. What scientists do is ‘study’ what God has done. I was a product of the public school system of the 1950s and 60s, so evolution was the origin system that was taught exclusively. When I began investigating the claims as an adult, I discovered several problems that I outlined here – https://gracelifethoughts.files.wordpress.com/2011/12/convince-me-there_s-ac2a0god-part-one.pdf . That was 1971 and I’ve continued to discover problems with evolution since then. The scientific case for creation seems strong. What do you believe about God, earth age and origins? Thanks! so, my question was… do you personally believe that the earth is thousands not millions or billions of years old? you didn’t seem to answer. Hi, Kia. I believe life forms on earth are most likely thousands rather than millions or billions of years old. That may be true of the earth itself. As a journalist, I observe and ask questions. There are many scientific disciplines to study in search for information about the earth’s age, so there are many observations to be made and questions asked. While the discussion of earth’s age has some interest for me, a greater interest lies in our relationship to the God who created us. I believe God will one day answer all of the questions we cannot answer now. He will judge us on the answers we do have now and what we’ve done with those answers. You mentioned earlier that you are not an atheist. What do you believe about God? Thanks! science doesn’t seem to have the same ‘open endedness’ for the question of the age of the earth as you seem to. science has certainly proven that the earth is not thousands of years old. man and animals have existed here in some cases billions of years, and in modern human’s case millions of years. ‘appearance of age’ and what God ‘could do’ aren’t really scientific because they presuppose something you can neither prove or even demonstrate. it’s a ‘working theory’ in order to fit what we want to believe and what the bible clearly says into a scientific sounding argument. the science actually and repeatedly contradicts the bible. I think i’m going to sidestep your question about what i believe. what I believe about God is not the issue or point of your post and I’m not sure I want to be the distraction from your burden that you seem to want me to be. I don’t want to sound rude but your post posits a false equivalency between science and faith in God and what the bible says about reality. we believe what we believe about God and the Bible by Faith alone. your steady holding on to thousands of years rather than millions or billions of years for life on the planet, and the apparent freedom with which you would accuse God of lying to us about the True age of the earth by making it only ‘appear’ to be older seems to make the point clear. It seems that you are arguing from the perspective of an atheist so I don’t think it is very unreasonable to assume that you are one. One look at your blog, especially the very atheist friendly blogroll, would suggest to anyone who reads that, at the very least, your loyalties are with those who lack belief. Regardless, can you cite specific examples of where science has “repeatedly disproved the bible”? These are your words, it’s only fair that you back them up. Sorry, not an atheist as I said. And I would politely decline the offer to debate or argue with you on another person’s blog. I am actually a believer, but allow me to play devil’s advocate and advance the only “scientific” argument that an atheist could make since it seems KIA is not going to do so. “The bible teaches that God created all life on earth in 6 days about 6000 years ago, but evolution proofs that species evolved over millions of years, thereby disproving the bible.” How would you react? A second common one I have heard is: “Medical science proves that a corpse cannot be raised from the dead after 3 days (or even 36 hours). Therefore Jesus cannot have risen from death.” Now, I cannot take this last argument seriously, since the very point of the resurrection of Jesus as proof of His Messiahship and of God’s intervention (and thus also His existence) hinges on the fact that dead men do not naturally rise from death! While science can establish the laws of nature, the natural course of events, it is not equipped with the tools to investigate an once-off miraculous occurrence (unless it a priori dismiss the possibility of God’s existence… which is not science). History (also a science?) or crime scene investigation are better suited to this question (and/or epistemology, meta-physics and other branches of philosophy – would these be considered as science as well?). I am interested in seeing where you are taking this. Hi, koosvannermerwe. Thank you for your questions. Where I am taking this is that Christians can have civil and educated/informed discussions about science and the Bible with non-Christians. The Bible is an extremely large volume of material with tens of thousands of words. The many branches of science also contain extremely large volumes of material. We have much to discuss without either side (Christian and non-Christian) making general/sweeping announcements concerning their beliefs (e.g. science disproves the Bible, Christians are stupid, atheists don’t know what they are talking about). Christians are not all in agreement about the length of time God used to create the heavens and the earth, but we should agree that “In the beginning God created the heavens and the earth.” As for ‘evolution proofs that species evolved over millions of years, thereby disproving the bible,’ I think there is much to discuss about that. There is evidence for us to consider from different scientific perspectives: creationism, intelligent design and evolution, to name three. What do each of the groups present as evidence concerning origins? How does their evidence hold up under investigation? As I quoted in the article from National Geographic – “The big bang theory leaves several major questions unanswered. One is the original cause of the big bang itself. Several answers have been proposed to address this fundamental question, but none has been proven—and even adequately testing them has proven to be a formidable challenge.” Testing theories of origins is a great challenge, but one we should embrace and discuss using evidence, logic and reason. I would argue that evolution has not ‘proven’ that species evolved over millions of years and that the best thing we can do is look at the evidence together to come to the best conclusion. Has medical science ‘proven’ that a corpse cannot be raised from the dead after 3 days or even 36 hours? The resurrection of Jesus Christ is an event of history. Can medical science ‘prove’ that Jesus Christ did not rise from the dead almost 2,000 years ago? I would argue that medical science has not and cannot prove that. Medical science, in addition to the common observation of the population at large around the world at this time, can make a verifiable statement that the vast majority of people who die remain physically dead. The Bible would also be in agreement with that statement. In fact, God predicted the deaths of humans in Genesis 2 and most people born on earth have died and remained dead. However, God also predicted that some people would not die and that some people would rise from the dead soon after their death. God has also predicted that all humans will rise from the dead at a future time to appear before Him. Can medical science prove that those predictions were or are untrue? I would argue that medical science cannot prove it.